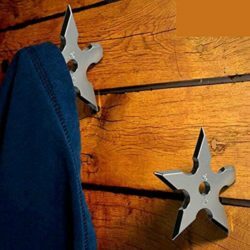 Be creative with your home decor with this cool looking Ninja throwing star darts on the wall or on the back door. Water resistance and sturdy, stainless steel. One corner of Ninja star coat hooks is cleverly featured with an embedded screw and smooth edges on other sides where you can hang your coat, hats and more.